We all know the advice for healthy teeth – brush twice daily and don’t eat too much sugar. So why do those of us following these instructions find we sometimes need a filling when we visit the dentist? The truth is, there’s a little more to preventing tooth decay than these guidelines suggest. Here’s what you need to know. How you brush makes a big difference. The mechanical act of brushing removes the very sticky dental plaque – a mixture of bacteria, their acids and sticky byproducts and food remnants. It forms naturally on teeth immediately after you’ve eaten but doesn’t get nasty and start to cause damage to the teeth until it reaches a certain stage of maturity. The exact amount of time this takes isn’t known but is at least more than 12 hours. Bacteria consume sugar and, as a byproduct, produce acids which dissolve mineral out of the teeth, leaving microscopic holes we can’t see. If the process isn’t stopped and they aren’t repaired, these can become big, visible cavities. Taking two minutes to brush your teeth is a good target for removing plaque and you should brush at night and one other time daily. Brushing frequently stops the bacteria developing to a stage where the species which produce the most acid can become established. 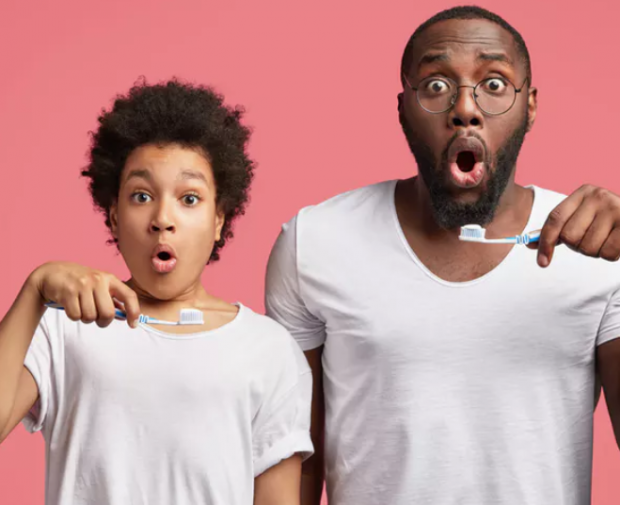 Electric toothbrushes can be more effective than manual brushing and a small toothbrush head helps to reach awkward areas in the mouth, while medium-textured bristles help you clean effectively without causing harm to gums and teeth. The main thing, however, is to get brushing! For maximum benefit, use toothpaste with 1350-1500 ppmF – that’s concentration of fluoride in parts per million – to prevent tooth decay. Check your toothpaste’s concentration by reading the ingredients on the back of the tube. Not all children’s toothpastes are strong enough for them to gain maximum benefit. Your dentist may prescribe higher strength fluoride toothpaste based on their assessment of your or your child’s risk of tooth decay. Plaque is difficult to see because it is whitish, like your teeth. Disclosing tablets are available in supermarkets and chemists and they make plaque more visible, showing areas you may have missed when brushing. At night, you produce less saliva than during the day. Because of this, your teeth have less protection from saliva and are more vulnerable to acid attacks. That’s why it’s important to remove food from your teeth before bed so plaque bacteria can’t feast overnight. Don’t eat or drink anything except water after brushing at night. This also gives fluoride the longest opportunity to work. Once you’ve brushed, don’t rinse your mouth with water or mouthwash – you’re washing away the fluoride! This can be a difficult habit to break, but can reduce tooth decay by up to 25%. Intrinsic sugars are found naturally in foods like fruit and they are far less likely to cause tooth decay than added or free sugars. Free sugars are generally those added to foods by manufacturers but also include honey, syrup and fruit juices. These are all easy for bacteria to consume, metabolise and produce acids from. However, it can be difficult to tell which are the worst sugars for teeth. For example, although normal amounts of fruit are fine, fruit juices have sugar liberated from the plant cells and heavy consumption can cause decay. The World Health Organization and NHS recommend free sugars should ideally make up less than 5% of your daily calorie intake. So what does this look like? For adults and children over about 11 years old, this is around 30g – about eight teaspoons – of sugar daily. Although not as important as how much, how often you eat sugar also matters. Simple carbohydrates like sugar are easier for bacteria to digest than proteins or complex carbohydrates. Bacteria produce acids after they metabolise sugar which causes demineralisation. Fortunately, through the actions of fluoride toothpaste and the remineralising effects of saliva, your teeth can recover from the early stages of these attacks. It’s like having a set of scales – trying to keep the balance between sugars on one side, fluoride toothpaste and cleaning on the other. Typically, your teeth can be exposed to four “sugar hits” – episodes of sugar intake – daily without irreversible damage to the teeth. Why not try counting how many sugary hits you have a day? This includes biscuits, cups of sugary tea or coffee and other snacks with refined carbohydrates like crisps. A simple way of cutting down would be to stop putting sugar in hot drinks and limiting snacking. Brush twice daily with fluoride toothpaste, spit don’t rinse, eat and drink nothing after brushing, and don’t have sugar more than four times daily. Easy!